Join the CSZ clergy and the T.G.I.S. Players for minchah, our joyful, musical and participatory Kabbalat Shabbat service, and Ma'ariv. Appropriate for all ages and open to the community at no charge. Come as you are. Leave Inspired. Following the service, join your Shaarey Zedek family for a festive, Chanukah-themed Shabbat dinner. Enjoy good company and conversation over a meal prepared and hosted by the Empty Nesters! Children ages 4-10 are $10 each. Children ages 0-3 are free. 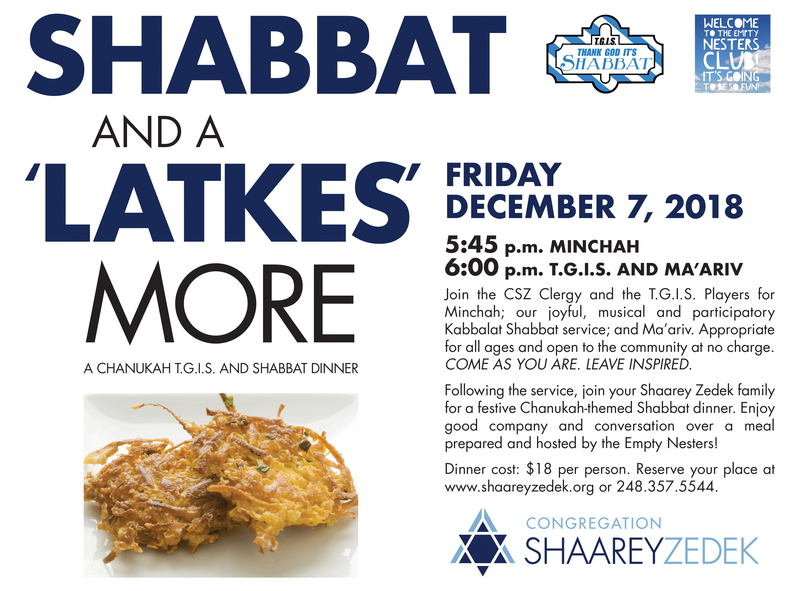 Reserve your place at www.shaareyzedek.org or 248.357.5544.